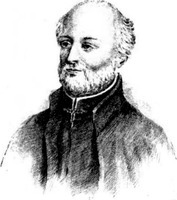 RALE (Râle, Rasle, Rasles), SÉBASTIEN, priest, Jesuit, missionary to the Abenakis; b. 4 Jan. 1657 at Pontarlier, diocese of Besançon (France); killed 23 Aug. 1724 (n.s.) at Norridgewock (Narantsouak, today Old Point, South Madison, Me.). Rale had joined the Society of Jesus at Dole (France) on 24 Sept. 1675. He arrived at Quebec 13 Oct. 1689, at the same time as Buade* de Frontenac. He was first sent to the mission at the falls of the Chaudière River which was directed by Father Jacques Bigot. There he learned the Abenaki language and began his Abenaki-French dictionary, as is indicated on the first page of his manuscript, which is preserved at Harvard University. In 1691 he went to assist his confrère Father Jacques Gravier at the mission to the Illinois at Kaskaskia. At the end of two years he was recalled and sent to Acadia, where in 1694 he founded the mission to the Abenakis at Norridgewock on the Kennebec River, almost opposite its junction with the Sandy River. The Abenakis traded with the English, who were situated closer to them than were the French, but they remained attached to the French through the bonds of the Roman Catholic religion. When the War of the Spanish Succession broke out in Europe and spread to the colonies in America, Governor Dudley of Boston called the Abenakis together at Casco Bay in 1703 and proposed to them that they remain neutral in this conflict. Moxus and Atecouando were the chief spokesmen for the Indians. Rale said that he was present at this meeting and promised to encourage the Indians to maintain the peace: “My religion and my office of priest were a security that I would give them only exhortations to peace.” Dudley, on the other hand, said that “their [the Indians’] Friars” did not dare to be seen on this occasion. There were reprisals by the English. During the winter of 1705, 275 soldiers under the command of Colonel Hilton were sent to Norridgewock to seize Father Rale and sack the village. Father Rale escaped them, but they burned his church. He later returned to Canada to found at Bécancour a mission for the Abenakis from Amassokanty (Amesoquanty; near Norridgewock, today Farmington Falls, Me.). Under the threat of famine these Indians had accepted Vaudreuil’s invitation to come to settle on the shores of the St Lawrence. 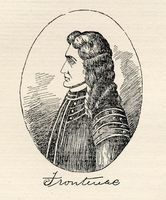 The minister, Pontchartrain, had moreover written on the king’s behalf to the Jesuit superior Pierre de La Chasse* to have Father Rale recalled, as he was suspected of being lukewarm about the war. Rale was back at his mission at Norridgewock in 1710. By the treaty of Utrecht (1713), which ended the War of the Spanish Succession, France gave up Acadia according to its “antient boundaries.” The exact extent of these boundaries was not spelled out in the treaty, and they gave rise subsequently to continued disputes between France and England. For the English, they extended to the St George River and took in the Abenakis’ territory. The Abenakis refused to accept English rule [see Mog], and the French encouraged them in this refusal. The English offered to rebuild the church at Norridgewock if the Abenakis consented to receive a Protestant minister and send Father Rale back to Quebec. The church was rebuilt in time by the English, but the men who were hired to do it seem to have done a poor job. By 1720 Father Rale had finished the work with the financial assistance of the French king. Reverend Joseph Baxter was sent as a missionary to Arrowsic Island on the Kennebec, and soon entered into a heated correspondence with Rale over their respective missions. It is not known how long Baxter worked on the Kennebec, but he does not seem to have had great success with the Abenakis. Through trade, however, the English succeeded in infiltrating the Abenakis’ territory. First they obtained permission to have stores, where they sold merchandise cheaply. Then they brought in hundreds of families and built forts to protect them. Rale feared for the faith of the Indians, for once the English controlled their territory, they would no longer allow any Catholic missionary to remain there. The expansion of the English into the Kennebec area led to a conference in August 1717 at Arrowsic Island, between Governor Shute of Massachusetts and the leaders of the eastern tribes. There seem to have been both pro-English and pro-French factions in the Indian delegation, the spokesman for the latter being Wowurna. Although the pro-English faction finally prevailed at this conference, and the Indians accepted the English presence on their lands, Father Rale encouraged the anti-English elements to continue to resist. In October 1719, he sent the chiefs of Norridgewock to Vaudreuil at Quebec to assure him that the Abenakis were opposing English encroachment on their land. In 1720, Vaudreuil and Bégon*, the intendant, reported to the minister of the Marine that “Father Râlle continues to incite the Indians of the mission at Naransouak not to allow the English to spread over their lands.” In July, the Massachusetts council offered a reward of £100 for the arrest of Rale. According to a letter of Vaudreuil and Bégon, dated 8 Oct. 1721, Rale had feared the previous spring that more and more Indians would come under the influence of the English, and wanted to ensure that “the well-disposed party among the Indians was more numerous” at a meeting which the English were intending to hold soon with the Abenakis. To this end he sent to Quebec six Indians who were to invite the Canadian Abenakis and the Hurons of Lorette to come to the meeting. They succeeded in recruiting several canoes of Indians from the missions at Saint-François, Bécancour, and Jeune-Lorette (Loretteville). Father La Chasse was sent with them to Norridgewock and recruited more than 100 Indians from other Acadian missions. On 28 July 1721 (17 July, o.s. ), more than 250 Indians, with Fathers La Chasse and Rale supporting them, appeared for the meeting with the English at Georgetown on Arrowsic Island. They presented a letter, addressed to Shute, which demanded that the English withdraw from their lands. The letter was sent on to the governor. In July of the same year, a party of Abenakis attacked the English settlements around Merrymeeting Bay, near the mouth of the Kennebec, in revenge for the English attack on Norridgewock. This act led Governor Shute to declare war on 25 July, marking the beginning of what was known, variously, as Dummer’s, Lovewell’s, Father Rale’s, or the Three Years’ War. The English again tried to seize Father Rale on two occasions in the period February–March 1723, but without success. In August of the following year, however, another attack was launched against Norridgewock which ended with Father Rale’s death. The New England force, under Johnson Harmon and Jeremiah Moulton*, set out from Fort Richmond (Richmond, Me.) on the lower Kennebec on 19 August (8 August, o.s.) and reached Norridgewock on the 23d. Father Rale was killed during the attack which ensued, and his scalp was taken to Boston to be redeemed. The French and English accounts of the raid disagree sharply on some points, however. The principal French account is contained in a letter of Father La Chasse of 29 Oct. 1724 (the basis of Charlevoix*’s account), and originated no doubt with Indians who witnessed the event and escaped to Quebec; that compiled by the New England historian Thomas Hutchinson is based on the testimony, taken many years later, of New Englanders who took part in the raid. According to La Chasse, the New England forces numbered about 1,100 men; the New England account states that there were only slightly more than 200, 40 of whom were left downstream to guard boats. The French contended that Rale went out into the middle of the village alone to meet the attacking English, in the hope that he might draw their attention to himself and save the Indians, and that he was shot down in the open. According to the English, however, Rale was killed in a cabin while defending himself against the attackers, and this against the orders of Moulton, who had wanted the priest to be taken alive. In 1833 Bishop Fenwick of Boston had a monument to the memory of Father Rale erected on the spot where he is supposed to have died. Sébastien Rale evoked strong and contrasting feelings in most of his contemporaries: for some, he was “a martyr . . . sacrificed through hatred to his ministry . . .” (La Chasse); for others, he was “a bloody incendiary” (Penhallow). The French considered him a valuable ally, the English a dangerous enemy. Many later writers have shared one or the other of these views. The deep political and religious allegiances felt by the English and French at this period undoubtedly influenced most contemporary writings, making it impossible now to construct a completely objective picture of Rale and his work. For a period of about ten years after the treaty of Utrecht, Rale’s mission at Norridgewock was at the centre of an area where the political and military interests of New France and New England met and clashed. His influence among the Norridgewock Abenakis could not be limited to his missionary work. The increasing English settlement in the Kennebec area was a threat to the Abenakis, and Father Rale consistently supported those elements in the tribe which maintained an active resistance to the English. The French, for their part, needed the Abenakis as allies who could provide protection for the eastern boundaries of New France. They could not, however, openly support the Abenakis at this time because they were officially at peace with the English. Instead they had to rely to a great extent on the influence of French missionaries. Rale shared the fate of many other missionaries of this era who, willingly or not, found themselves and their work caught up in the larger colonial struggles of France and England in the New World. AN, Col., B, 23, f.261; 48, f.853. Charlevoix, History (Shea), I, 88–89; V, 133, 167, 266–81. Coll. de manuscrits relatifs à la N.-F., III, passim. “Correspondance de Vaudreuil,” APQ Rapport, 1938–39, 16. Documentary hist. of Maine, IX; XXIII, 51–57, 89–93. JR (Thwaites), LXVII. [Pierre-Joseph de La Chasse], “Une relation inédite de la mort du P. Sébastien Racle, 1724,” in NF, IV (1929), 342–50 Lettres édifiantes et curieuses escrites des missions étrangères par quelques missionaires de la Compagnie de Jésus (30v., Paris, 1707–73; nouv. éd., Paris, 1781), VI. Mass. Hist. Soc. Coll., 2d ser., VIII (1826); 5th ser., III (1877), 245. NYCD (O’Callaghan and Fernow), IX, 936–39. Penhallow, Hist. of wars with Eastern Indians (1824). PRO, CSP, Col., 1720–21, 1722–23, 1724–25. J. P. Baxter, The pioneers of New France in New England, with contemporary letters and documents (Albany, 1894). Campbell, Pioneer priests. Coleman, New England captives. F. Convers, “Life of Rev. Sebastian Rale,” in The library of American biography, ed. J. Spark (25v., Boston, 1834–48), 2d ser., VII. N.-E. Dionne, “Le père Sébastien Rasles, jésuite, missionnaire chez les Abénaquis, 1657–1724,” RSCT, 2d ser., IX (1903), 117–34. M. C. Leger, The Catholic Indian missions in Maine, 1611–1820 (Catholic Univ. of America studies in American church history, VII, Washington, 1929). Parkman, A half-century of conflict, (1893), I. Rochemonteix, Les Jésuites et la N.-F. au XVIIe siècle, III, 434–36, 439–75, 530, 537. J. F. Sprague, Sebastian Ralé, a Maine tragedy of the 18th century (Boston, 1906). Thomas Charland, “RALE, SÉBASTIEN,” in Dictionary of Canadian Biography, vol. 2, University of Toronto/Université Laval, 2003–, accessed April 24, 2019, http://www.biographi.ca/en/bio/rale_sebastien_2E.html.